The ICC Banking Commission is a leading global rule-making body for the banking industry, producing universally accepted rules and guidelines for international banking practice. 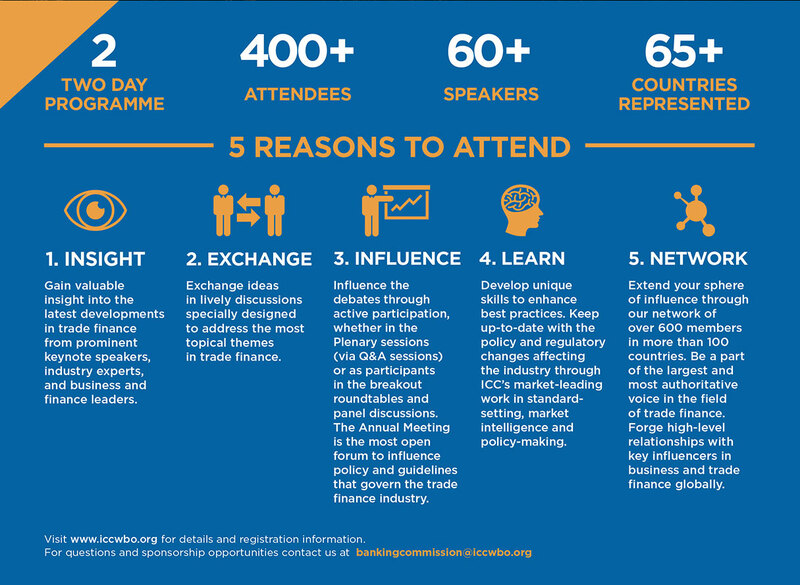 This annual gathering not only advances the work agenda of the ICC Banking Commission’s but also presents a unique opportunity to rethink the future of trade finance and influence policy governing the industry. 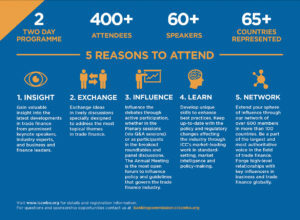 Offering insight into the latest developments in the field, each year the engaging two-day programme attracts over 300 participants from more than 65 countries each year, offering for face-to-face interaction among members and a chance to discuss an array of issues facing the industry worldwide. Sessions are designed to address the most pertinent issues in the current landscape and feature prominent speakers, industry experts and leaders from the world of business and finance. 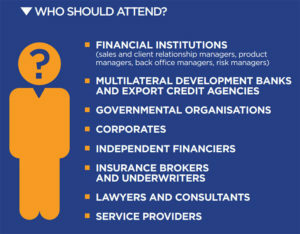 As the ICC Banking Commission’s flagship event, the meeting is one of the most important events on the banking calendar, offering unrivalled networking opportunities with participating experts, banking professionals, business leaders, lawyers and government officials. The inaugural Banking Commission meeting was held over 85 years ago marking the launch of a process that saw the Banking Commission achieve global recognition and reach. 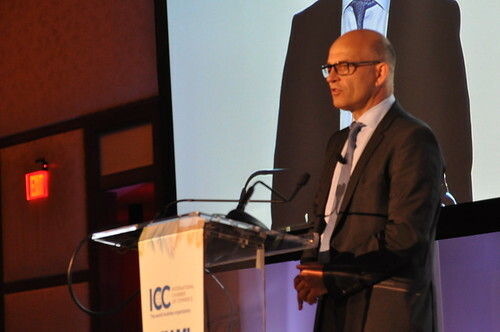 The ICC Banking Commission has a vital role to play in facilitating the supply of trade finance and informing associated regulatory discussions. 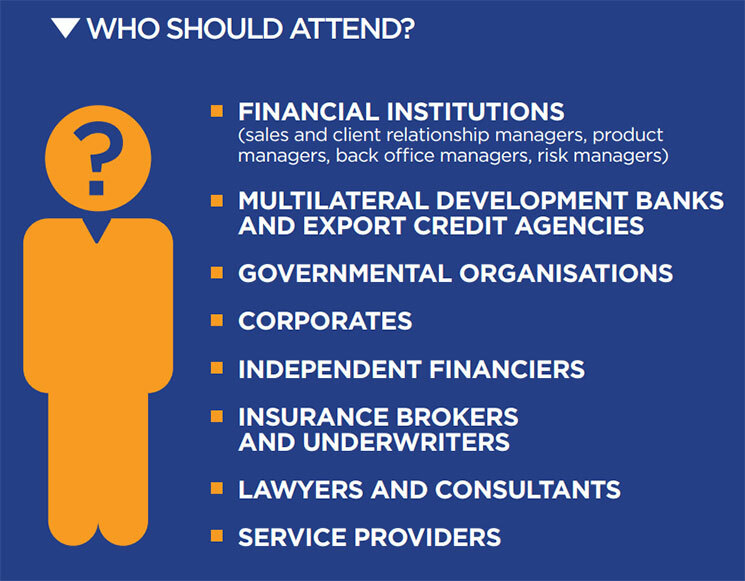 The Annual Meeting is an excellent opportunity to bring together leading experts in trade finance to shape the trade finance landscape for the benefit of businesses and consumers across the world.